Moderate rain (всего 14.0mm), heaviest во вторник после обеда. Mild temperatures (максимум 7°C в понедельник после обеда, минимум 1°C во вторник вечером). Wind will be generally light. Mild at first with light rain (всего 2.0mm) в среду после обеда followed by colder weather and light fall of snow, heaviest в четверг вечером. Freeze-thaw conditions (максимум 3°C в среду вечером, минимум -4°C в пятницу вечером). Mainly сильный ветер. Таблица выше представляет прогноз погоды в Alpe d'Huez, сформированный для определенной высоты: 2225 m. Наши уточненные погодные модели позволяют дифференцировать прогнозы между вершиной, серединой и нижней точкой катания на склоне Alpe d'Huez. Чтобы переключаться между ними, используйте линки выше таблицы. Чтобы получить предоставление об изменении погоды в регионе в целом, попробуйте наши Погодные карты для France. I skied in Alpe d' Huez 29-3-2019. This ski resort is 90 min. away from Grenoble. The bus company Transaltitude organises day trips from Grenoble there and return. The bus departs at 07:30 and returns at 18:45 (departing from ski center at 17:05). Bus ticket including ski ticket at the price of 45 Euro. If you buy the ski ticket it costs 53,50 Euro per day. Ski equipment at the price of 37,50 Euro. It is a huge resort consisting of more interconnected ski resorts. The snow was icy and hard until 12:00 and after, soft and even slushy. This is due to sun and high temperatures. However, the pistes were very well maintained and preprepared. I skied approximately 5 hours and about 21 pistes with the following order: lift Marmottes 1, blue piste Ancolies, red piste Poutran, lift Champclotury, blue piste Champclotury, blue piste Chevreuils, gondola L' Alpette, blue piste Chalets, blue piste Les Travers, green piste Ecureuils, lift Montfrais, red piste Stade, lift Vallonnet, blue piste Edelweiss, blue piste Vaujaniate, gondola La Villette, lift Montfrais, blue piste Cascade, black piste La Fare, gondola Vaujany - Alpette and Alpette - Rousses, red piste Le Belvedere (here took a break), red piste Chamois, green piste Chez Roger, list Alpauris, lift Louvets, blue piste Le Col, lift Auris Express, blue piste Les Demoiselles, lift Fontfroide, red piste Fontfroide, lift Alpauris, lift Rifnel Express, green piste Clarines, lift Signal, piste La marcel, lift Les Jeux, green piste Chez Roger and this is the end. It is not possible to ski all the pistes in one day. I tried to do as much as possible and had a really good time. This ski resort consists mainly of blue and red pistes, totally recommendable for intermediate skiers. 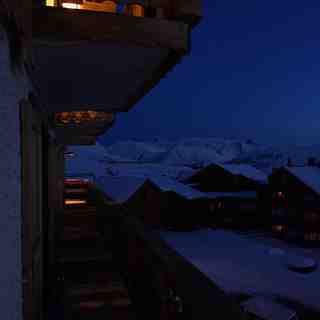 The Alpe d'Huez skiing weather widget below is available to embed on external websites free of charge. 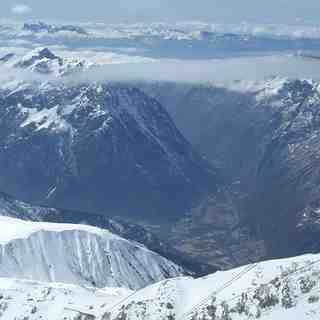 It provides a daily summary of our Alpe d'Huez snow forecast and current weather conditions. Simply go to the feed configuration page and follow the 3 simple steps to grab the custom html code snippet and paste it into your own site. You can choose the snow forecast elevation (summit, mid-mountain or bottom lift) and metric/imperial units for the snow forecast feed to suit your own website…. Нажмите здесь, чтобы получить код для HTML-страницы.